'Organisation Commune Africaine et Malgache'; the French-speaking States of Africa and Mauritius belong to it; it strives towards co-operation in political, economic, social, technical and cultural matters. 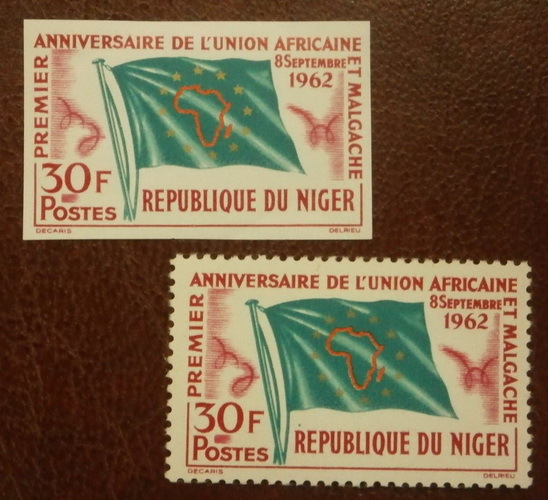 The organisation, which since 1965 has this name, developed from the 'Union Africaine et Malgache' (UAM), of which in March 1961 the Ivory Coast, Upper Volta, Niger, Dahomey, Chad, Congo (Brazzaville), the Central African Republic, Senegal, Mauritania, Cameroon, Gaboon and Madagascar became members. Later Congo (Kinshasa), Ruanda, Togo became members; Mauritania stepped out. On the UAM-conference of April 1962 a common flag was adopted, for which according to the goals set by the organisation only the pan-African colors would be right. The example for the graphic design apparently was the flag of the European Council: on a green field 12 golden stars (here clearly identified as the founding members of the organisation) in a circle surrounding a red map with yellow fimbriation of not only all member-states, but of the whole continent including the island Madagascar. It shows a variant of the OCAM flag, at the occasion the first anniversary of this organization's founding in 1961. The flag shown mainly differs in the fact, that the map of Africa is not shown in red, fimbriated yellow, but in background colour (turquoise), fimbriated yellow. A similar stamp is already mentioned at here. Perhaps the stamp itself is mentioned at here.